I finally got my ornaments for Amy's swap finished and in the mail. All good intentions to do this a month ago obviously didn't happen. Seems I work better with a deadline. I used my new wool to needle felt these little guys. It's so hard to photograph wool for some reason. This was the least blurry of the shots I took. The second part of Amy's swap was to make five ATCs, the theme being Christmas. 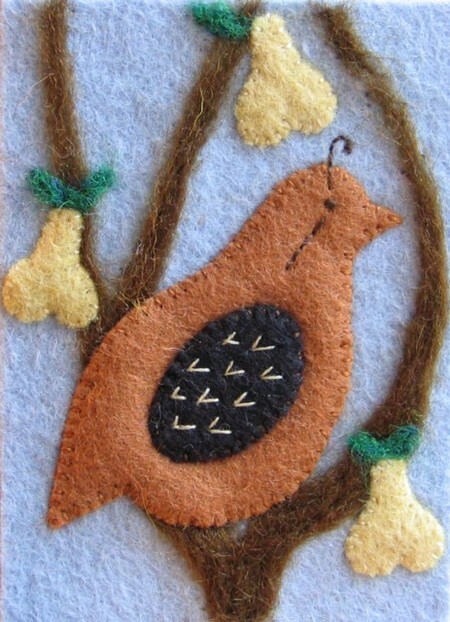 I have always loved the Partridge in the Pear Tree for some reason. Maybe because it's the "First Day of Christmas". Maybe it's because as a kid I had a wild crush on this guy. Like previous ATC swaps of Amy's, I made these out of felt, but worked a little needle felting in there for a different look. 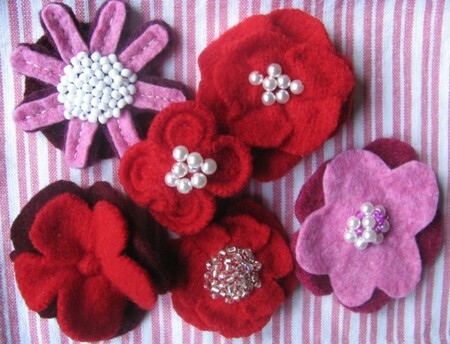 One last bit of felt craft are these pins. I used scraps from wool sweaters I had been crafting with to make these. And as I admire Raspberry's pins SO much I had to add pearl beads on some of them to try and capture the look she creates with her gorgeous hand made felt pins. Mine certainly pale in comparison, but these were so fun and quick to stitch up. Thank you for your inspiration Alice!